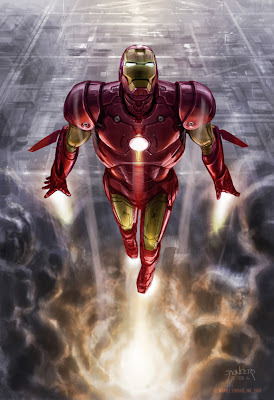 Phil Saunders' Random Stuff: Ironman opens!!! Yes, it's finally here! And it does truly rock. Ironman opens wide today, and I'm hoping everyone goes to see it, since it represents about a year and a half of my life. I collaborated on the design of the Mk 3 suit with comic art genius Adi Granov, as well as designing Tony Stark's house, the Stark Jet & designing, storyboarding and directing the previs for the "suit-up" sequence. My own site is due for an overhaul (and it's really hard to update, thanks to my lame website programmer... uh, me,) so I'm going to start posting some design sketches up here on the old blog. Look out for them! Sadly there's no "Art of Ironman" book announced (sigh.) I guess they were hedging their bets in case the movie flopped. Which I can tell you after seeing it, it most decidedly WILL NOT. You're all in for a treat. CTV (a canadian television network) just posted an interview with me about my role in the design of the Ironman Mk3 suit. You can check it out here. WOW! i just came back from the theater and Barnes and Nobel looking for anything close resembeling an art book for the movie then i found your blog to repair my broken heart. That movie was brillant on i think every level. It was so inspiring for an artist like myself. Thank you for showing us your art. I really can't wait to see what else you show to uplift us and exhilarate our imaginations.